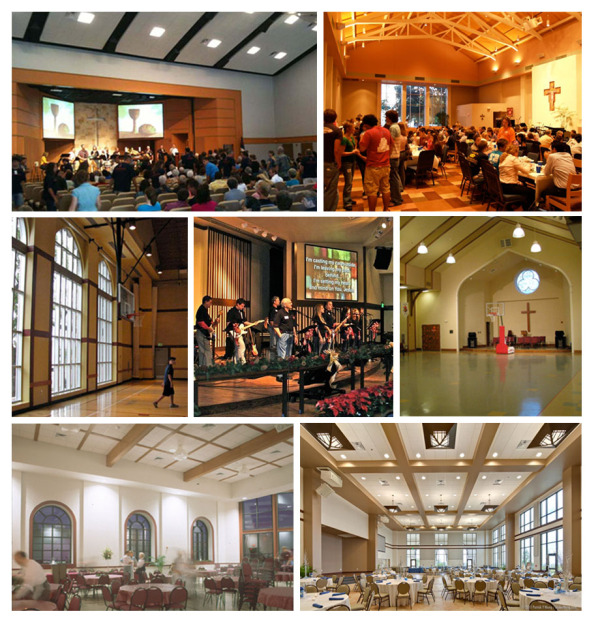 Call them Fellowship Halls, Family Life Centers, Multi-Purpose Rooms or Parish Halls - for many congregations, these are the spaces that get the most use. Heimsath Architects has a long history of designing and renovating these types of facilities. Click below to see a portfolio of some of our recent Fellowship Halls. Fellowship Halls are shared by a number of groups for a wide variety of activities. They are frequently used for temporary or permanent worship, so the design should always consider aesthetic quality, acoustical properties and lighting sources. How groups circulate in and out of the hall is important. A design should address the connection to a foyer or gathering space and possibly an outdoor activity space. Support spaces, such as kitchens, bathrooms, storage, performance stages, green rooms and music rooms should be considered in planning for a successful Fellowship Hall.